Clockwise: Peter Rutledge Koch and Debra Magpie Earling. The Lost Journals of Sacajewea, 2010. Photo: Peter Koch. Art Hazelwood. Tora Bora: An Opera in Three Acts, 2011. Bettina Pauly. Crazy Carousel in a Box –”Sea World”, 2009-2010. 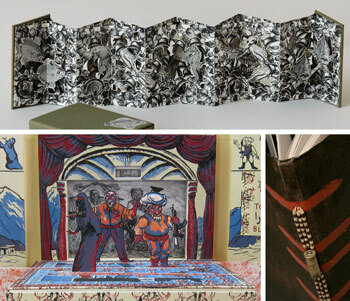 At a time when mainstream publishing houses are questioning the very need for books published in traditional, physical formats, artists who create books continue to creatively push the limits of the genre. Made primarily by Bay Area artists, the books included in Rebound survey a variety of formats and display a wide range of processes that currently interest the contemporary artist engaged in making artist’s books. Curated by Simon Blattner.